The only constant color fish see on a spinner are the beads. Blades add color to change the overall color of the spinner as well as providing flash and vibration to attract fish. Spinner blade size and style are important. The rule of thumb for selecting the style of blades. Colorado are best in stained or cloudy water. They produce more water displacement and present a larger frontal profile to the fish. Willowleaf are best in clear water. They produce less water displacement but present a very clear side profile. Indiana are a compromise between Colorado and Willowleaf. The rule of thumb for selecting blades for trolling speeds. Slow trolling speeds are best for Colorado, Willowleaf for power trolling, Indiana are again the compromise between low and high speed trolling. The rule of thumb for creating color combinations. Every bead / blade color and style combination forms an unique lure for catching fish. Only through experimentation will provide the correct lure for a particular situation. Our "Quick Change System" makes it possible to find that correct lure as fast as possible. And our spinner components give you a very wide range of color/styles of beads and blades to cover all types of fishing situations. How do I select the right quick change fishing weights and rigging? The advantages of the Quick Change weight system. Reduced wear on line, the ability to use all kinds of different weights with a snap, and at the end of the day, snapping off your weight will greatly extend rod life. To determine the type of weight to achieve the depth for presenting your lure or rig correctly so you catch fish is critical to success. Obviously, lighter weights are fished slower and shallower and heavier weights faster and deeper. The most important function of a weight is for the fishermen to know where their lure or bait is in relation to the bottom. Generally speaking, weights fall into three categories. Walking and standup sinkers, split shot. These weights work best at slow to very slow trolling speeds or casting retrieval speed. A smooth bottom that is snag free is the best place to use these weights and the fish must be close to the bottom. These weights create a mud trail, much like a minnow or small forage, as they move across the bottom. All types of bottom bouncer weights. The Quick Change Lite Bite bouncer, the standard bottom bouncer, and the three way drop weight all basically work the same. They can contact the bottom or be trolled just above the bottom. If they contact the bottom, they create a mud trail as mentioned above and give the fishermen a feel for the type of bottom they are fishing. When fishing these styles of weights, they should only tick the bottom. These bouncers are best used in snag infested places. But if they are dragged on the bottom, they will snag as frequently as the sinkers. Maintaining a 60 degree angle will make these most effective when trolling in snag infested areas. Snap weights or downrigger type weights. These are designed to control your lure or bait at precise depths. They don't follow the contour of the bottom as the weights above. Important rigging instructions for the Quick Change System. When rigging your Quick Change weight snap, it is important that you place a bead at the back end before you tie your snap swivel to the line. This helps protect your knot on the snap swivel and tangling. 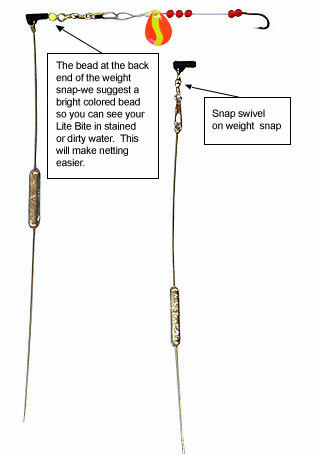 Many fishermen rig the weight snap with a snap swivel as illustrated. Even though you can easily twist weights in and out of the weight snap, installing a snap swivel make changing weight even easier and also reduces twist when fishing the Lite Bite bouncer. 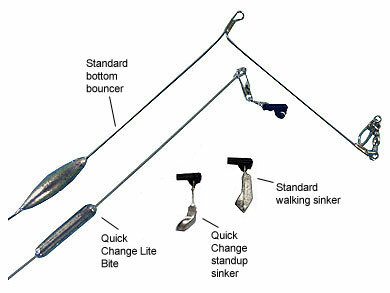 The Lite Bite bouncer has less drag due to low profile weight design plus, when rigged correctly, the Lite Bite allows you to “feed the fish line” as the weight snap allows line to slip through it. The Quick Change standup sinker actually stands up and because the sinker contacts more of the bottom, you have more feel and can use less weight. We believe both of these weights will reduce snagging substantially when fished and rigged correctly. The most important reason weights are used, is to know where the bottom is in relation to your lure. Use enough weight so you can feel the bottom and put the lure in front of their face. How do I make Quick Change Spinners? When making your own spinners, here are a few of the important things to remember. Determine the length of the spinners you want to make and cut several pieces of line to that length. 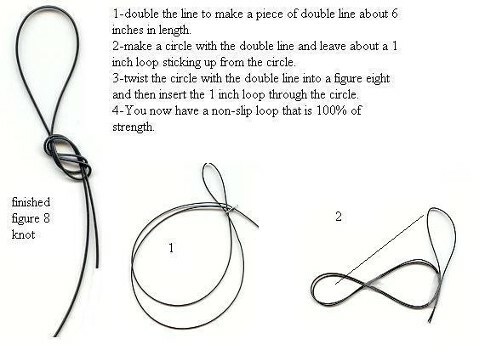 Remember to add about 10 inches over your desired fininshed spinner length for snelling and tying your top loop. We would highly recommend to use several different bead colors combinations to create different color combinations for your spinners. You can mix and match beads on a spinner or keep all the beads on the spinner same color. We would also highly recommend using the Quick Change clevis or blade snap so you have an unlimited number of options for creating different color combinations. We also highly recommend using quality hooks and line. Here are the drawings to help you tie the salmon-steelhead snell knot if you want the strongest snell available. 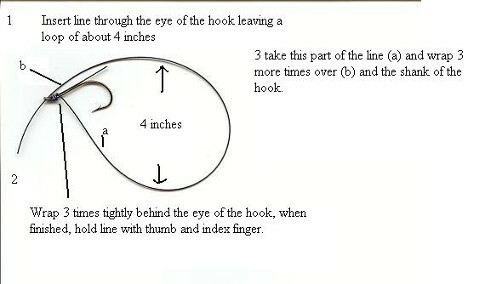 Now make three tight coils around the shank of the hook starting at the eye and wrap back. Make sure these wraps do not slip. After wrapping the three wraps, pull line tight and hold it with your index finger and thumb. Let the long end of the leader hang down. As you can see from the drawing above, we have inserted the long end of the leader line thru the hook from the back and have left about an 8 inch loop. The picture above illustrates the finished snell. 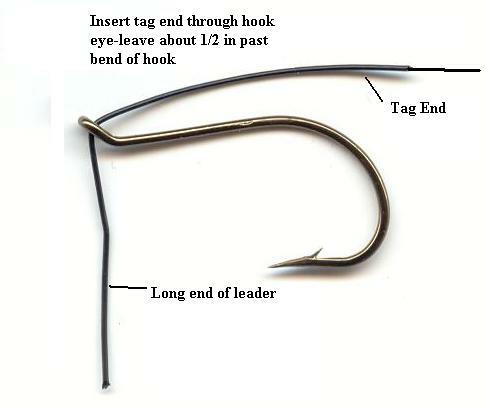 Make sure you hold the wraps around the hook securely when pulling the long end of the leader thru the hook eye. The trick is to hold the wrap tight enough so they don't unravel but not so tight to create friction when pulling the line thru. 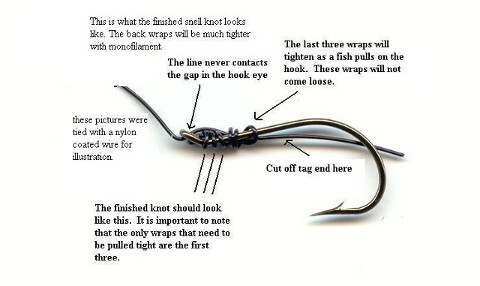 As you pull the line thru the hook eye, you will create a series of twists. If you spin the line as you pull the line thru, the twists will untwist and you will not have any kinks in your line. The first few tries will produce frustration. Have patience. An experienced sneller can snell between 100 and 150 snells an hour if the line is cut and ready to go. With a little practice, 50 snells an hour is very easy. To make a non-slip loop for the end of your spinner, take a look at the picture below. The figure eight loop is the strongest loop that you can tie on the end of any leader, it will not slip and does not need to be pulled tight. One reason knots fail is that they are pulled too tight and the line cuts itself.